Western Province wing Sergeal Petersen has been included in a 36-man Springbok squad for their end-of-year tour. Petersen played for the Boks in a non-cap match against the Barbarians in 2016 but has not worn the green and gold since. The other uncapped players in the squad are Petersen’s Western Province teammates, wing Ruhan Nel and lock JD Schickerling. Nel was called up to the Bok squad towards the end of the Rugby Championship but did not get a game. There were recalls for Japan-based outside back Gio Aplon and one-Test cap scrumhalf Louis Schreuder, who captained the Sharks to the Currie Cup title on Saturday. Prop Trevor Nyakane and lock Lood de Jager are back in the Bok fold after missing the entire international season to date due to injury, while No 8 Duane Vermeulen also returns after missing the Rugby Championship campaign due to his Japanese club commitments. 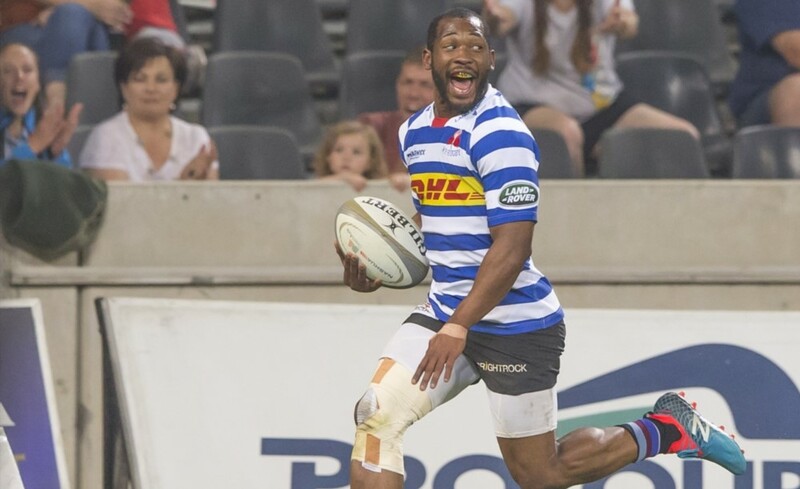 Lionel Mapoe, who was part of the training squad in Stellenbosch, was ruled out of the tour due to injury and joins Tendai Mtawarira, Ross Cronjé, Lukhanyo Am and Makazole Mapimpi, all of whom were part of the Rugby Championship squad, on the sidelines. Faf de Klerk, who is back with the Sale Sharks, has not been included in the squad, while Northampton Saints scrumhalf Cobus Reinach has been overlooked. Other notable omissions include the Du Preez brothers, Jean-Luc and Dan, and Akker van der Merwe, all of whom played for the Sharks at Newlands on Saturday. Van der Merwe was named Man of the Match. ‘This tour to the northern hemisphere will be another tough test of our team’s character and we are looking forward to the exciting challenges against England, France, Scotland and Wales,’ said Bok coach Rassie Erasmus. ‘It is always good to welcome new players to the Springbok environment and I’m excited to work with Sergeal and JD – I am sure they will bring a lot of energy into the group. ‘Gio has a lot of experience of playing in the challenging European conditions from his club rugby stint in France, while Louis has been impressive in the Currie Cup and also brings a lot of experience. Forwards – Schalk Brits, Lood de Jager, Pieter-Steph du Toit, Thomas du Toit, Eben Etzebeth, Steven Kitshoff, Vincent Koch, Siya Kolisi (c), Francois Louw, Wilco Louw, Frans Malherbe, Malcolm Marx, Bongi Mbonambi, Franco Mostert, Sikhumbuzo Notshe, Trevor Nyakane, JD Schickerling, RG Snyman, Duane Vermeulen, Warren Whiteley. Backs – Gio Aplon, Damian de Allende, Aphiwe Dyantyi, André Esterhuizen, Elton Jantjies, Cheslin Kolbe, Jesse Kriel, Wille le Roux, Ruhan Nel, Sbu Nkosi, Embrose Papier, Sergeal Petersen, Handré Pollard, Louis Schreuder, Ivan van Zyl, Damian Willemse.